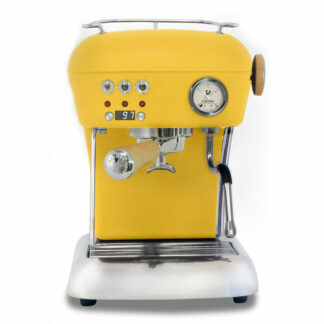 The Ascaso Dream UP V3 machine has had some extra elegance added to its already dynamic design! Ascaso has crafted the portafilter handle and steam knob out of Pyrenean boxwood–adding artful, chemical-free durability that you can feel! We love how this new addition in design compliments The Dream’s signature retro look. Plus, with the addition of the PID, control of the temperature of your coffee and hot water is at your fingertips! Adjustable temperature in one-degree increments. Programmable pre-infusion. (0 to 5 seconds). Alarms (5): Water/coffee ratio, coffee or steam gauge, coffee group or steam. (Display indicates error type). Unlike the other Dream models, the PID version has a 38W plate under the top panel actively warms cups, versus warming the cups with passive heat. The water tank on the Ascaso Dream PID is illuminated. Checking the water level in the early morning has never been easier! 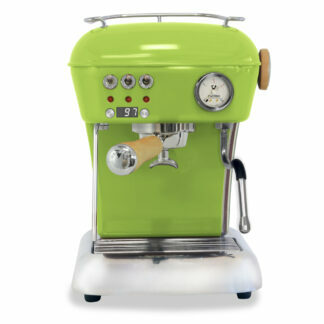 Unlike other machines made of steel and painted enamel, the Ascaso Dream UP has no chance of rusting. Remember, we are using water and steam to make our favorite drinks, so steel machines will rust at some point. The aluminum base does have a polish. Therefore, be careful of distilled or purified water which can ruin its finish. Also, keep in mind, the aluminum is hand buffed and polished. Hence, each base will have its character. The thermoblock is designed of aluminum for fast warm up times and thickness for good temperature stability. Aluminium also avoids ‘pitting’ in cases where purified water is used. The inside pipe for which water comes in contact for heating is made of stainless steel. Another bonus? The thermoblock in this case is less prone to limescale build up from magnesium and calcium – limescale is a major factor in causing problems on espresso machines. Allows you the ability to remove the portafilter immediately after brewing, turning your grinds into a puck, rather than a watery mess! Made of chrome plated brass, the grouphead on the Ascaso Dream UP evenly distributes heat and reduces hotspots for more temperature consistent espresso. It has also been designed to evenly distribute water across the coffee grounds for a better extraction. The ability to adjust the over pressure valve allows you to perfect your coffee to the flavor profile that is distinctly yours. The possibilities are endless! A microprocessor pulsates the pump so water in the reservoir continuously fills the thermoblock for continuous steam – until the reservoir runs near empty. Previous models had metal-to-metal closure for shutting off the steam/hot water valve. V3 models were upgraded with compression steam valves so there is a rubber gasket that makes the closure. The result? A lower chance of limescale buildup as seen on previous models! Frothing milk has never been simpler! 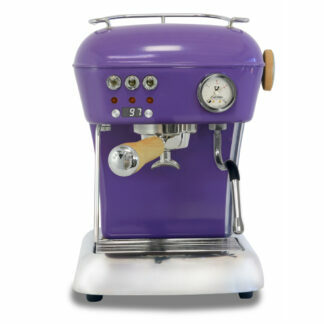 The panarello steam tip that Ascaso provides will have you making luxurious lattes and cappuccinos in no time. Ascaso also provides a new and improved steam tip for those who want a little more control with their microfoam. No conversion kits needed here! As of April 2014, Ascaso has combined the ground / pod system into one. Simply switch out the filter basket to brew with freshly ground coffee or E.S.E pods. Ascaso provides FOUR different baskets. Single and double pressurized filter baskets, Double non-pressurized basket, E.S.E Pod basket. Aluminum tamper–an upgrade to the plastic tamper most manufacturers include. Plastic scoop for pre-ground coffee. Espresso 4 Home, LLC markets and sells ONLY to distributors and retailers.